Santorini is not famous for its beaches. That is because the beauty of Caldera cliffs overwhelms our south and east coast. Since you are in Greece and on one of the Aegean islands, you should enjoy swimming at least once. Best Santorini beaches are situated on the south side of the island. Vlihada is the last beach in the row of Perissa and Perivolos before Akrotiri. The pumice stone hills just behind the beach keep it calm and quite. Chances are (except maby from August) that Vlihada will be quiet and not so crowded like Perivolos and Perissa. Before you reach the beach, you pass the small harbour, which is full with small traditional boats. It is a perfect spot for those wishing to avoid the big crows. 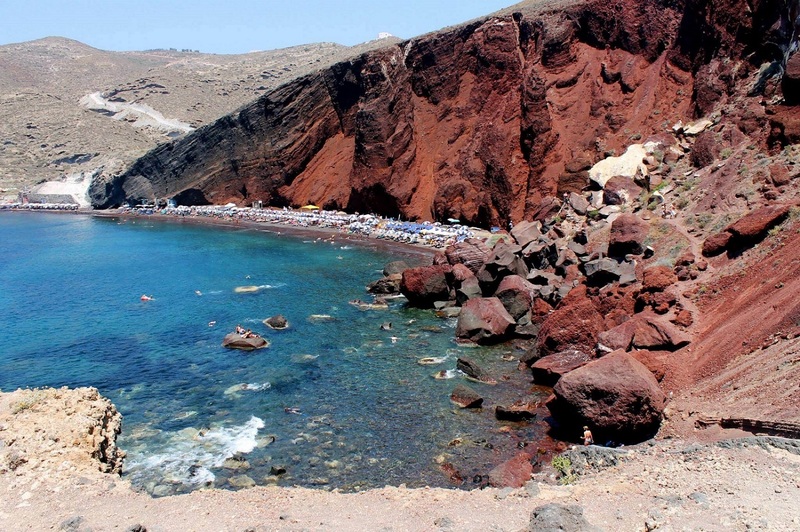 Probably the most well-known among Santorini beachs is the Red Beach. Although the stunning part, below the red rock, is considered as not safe due to small rock slides, it attracts many visitors. Of course, next to the rock, there is an organized area with umbrellas, sunbeds and snack bar. This, unique among Santorini beaches, is located 23 km. away from Oia. You can reach it with your own mean of transport or visit it by participating in one of daily cruises. You probably heard of or saw somewhere Perissa and Perivolos beach. Both of them share the same coast, which consists of black pebbles. In this location, restaurants, taverns and beach bars are numerous. As the coast stretches for about 3 km., it doesn’t get crowded enough, for you to have issues with finding a spot. Due to the black pebbles which extend on the seabed, the color of the sea in Perissa and Perivolos is black. As you can understand, the environment here is quite unique. It is interesting to know that on the north end of Perissa, there is a huge hill. On the top of it, you will find the ruins of Ancient Thira. It is worth to visit this archeological attraction, not only because of its importance for Santorini, but also because of the view. Perissa and Perivolos are situated 25 km. away from Oia and can be reached by bus or with your own means of transport. Kamari is another well-known beach in Santorini. It took its name from the coastal settlement that it’s part of. The environment of Kamari is similar to Perissa and Perivolos. Black and white pebbles dominate on the beach, as well as many choices for dining and sunbeds. If you wish to come here to relax, you might want to think again, because the airplanes landing on Santorini airport fly over this beach. 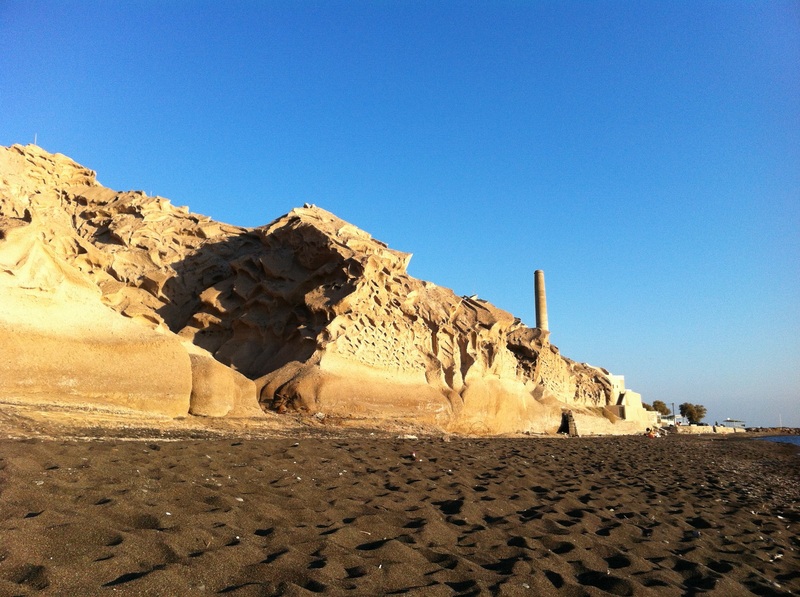 The impressive hill with Ancient Thira, this time, is situated on the south part of the beach. Kamari beach is located about 18 km. away from Oia. You can get here by bus or using your own mean of transport. HouseThe nearest beaches to Winery House are: Baxedes (1 Km), Amoudi (2Km), Katharos (2.5 Km), Kouloumbos (4 Km). Baxedes beach is easy reachable and it is a perfect solution for a quick swim. You don’t have to take an extended drive towards the south coast of Santorini, if you want to relax and listen to the waves. You will not find many people here, therefore, this is a perfect place if you which to have most of the beach to yourself.